Jon Rahm (+200) is the betting favorite after taking a narrow lead over Rory McIlroy (+250) and Tommy Fleetwood (+275) on Saturday in The Players Championship. 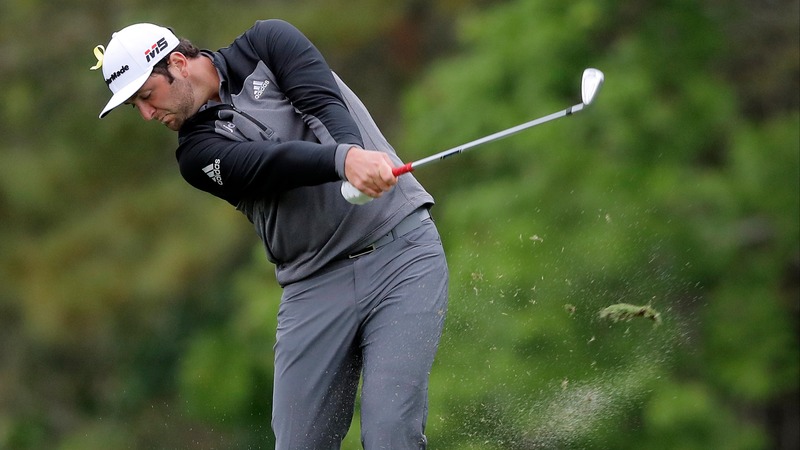 PONTE VEDRA BEACH, Fla. (AP) — Jon Rahm (+200) can't think of a shot he missed Saturday in his round of 8-under 64 that took him from five shots behind to one shot ahead of Rory McIlroy (+250) and Tommy Fleetwood (+275) in The Players Championship. The one bogey he made stood out for two reasons. It was nearly perfect, of course, a sand wedge into No. 6 that tracked the flag and landed next to the pin, except that it took a hard bounce and rolled over the back of the green. And his reaction to a potential birdie turning into bogey spoke to the calm Rahm feels, even on a course designed to fray nerves. There was no visible frustration, only more great golf. "I've been working so hard on the mental aspect of my game, trying to keep myself in check a little more," said Rahm, the 24-year-old Spaniard so full of passion. "And I think that has been the key this week. I've been so balanced — nothing like I used to be, nothing like before. I've been really proud of how I've been handling myself. "And hopefully tomorrow, it shows how different it has been." Rahm, [who opened at 25/1 odds](https://www.betchicago.com/the-players-championship-odds-tiger-woods), surged ahead with a 30 on the back nine of the TPC Sawgrass, sparked by a 4-iron into 3 feet for eagle and a wedge that stopped 2 feet behind the hole to a front pin on the par-3 17th for a tap-in birdie. He was at 15-under 201, enough for his first 54-hole lead on the PGA Tour, enough to keep McIlroy and Fleetwood from catching him. "Didn't miss many shots out there," Rahm said. "Really, really confident with my irons. Every time I stepped up, I felt like I was going to hit a good shot." McIlroy and Fleetwood struggled from the start and both eventually recovered, McIlroy sooner than Fleetwood, both finishing with a 70 that left them in excellent shape to capture the PGA Tour's biggest event. McIlroy muffed a chip and had to scramble for bogey on the opening hole, hit a chip over the green on the par-5 second hole and turned potential birdie into bogey, and that was as bad as it got. He still was under par at the turn by running off three birdies, including a 4-iron to a foot on the hardest par 3 on the course at No. 8. But after a two-putt birdie on the par-5 11th, McIlroy's chances dried up. Even on the par-5 16th, he tried a low runner out of the pine trees and it came out so hot that it ran through the green and into the water. Even so, he was bogey-free over the last 16 holes and shot 70. And he can at least avoid questions about winning from the final group, something McIlroy hasn't done in his last nine occasions dating to the start of 2018. "I just need to hit fairways and greens. If I can do that, and take the opportunities I give myself, hopefully I can turn tomorrow into the best Sunday of the year so far," McIlroy said. Fleetwood missed a 30-inch putt on the opening hole and took double bogey, and he fell three shots behind through seven holes. He holed a 30-foot birdie putt on No. 8 after McIlroy tapped in for his birdie, and then picked up four birdies where they were available. "Didn't have my swing today like I've had for the first two days, and really struggled with that early on," Fleetwood said. "The good thing about it was how good I was mentally, the character I showed. I was stuck in there on one of the toughest golf courses we play and managed to get an under par round out of it when I didn't really feel comfortable all day." Jason Day (10/1) had a 68 and was three shots behind. Tiger Woods was five shots better on the par-3 17th — a quadruple bogey on Friday, a 2-foot birdie putt on Saturday — but still started so slowly that even a late run of birdies was only good for a 72. He was 12 shots behind in his last stroke-play event before the Masters. Five players were within five shots of Rahm, the deficit the Spaniard made up on Saturday. That group included Brandt Snedeker (65) and Keegan Bradley (68), and Dustin Johnson, the No. 1 player in the world who played the par 5s at even and still shot a 69. The field is 60/1 entering Sunday. Rahm, who already has six worldwide victories in just short of three years as a pro, was still lagging behind when he made the turn, and then quickly moved to the top. After a short birdie on the 10th, he hit 4-iron from 243 yards to 3 feet on a front left pin at the par-5 11th for an eagle. He hit the right shot on the par-3 13th, with the pin below a ridge near the water, into 3 feet for another birdie. By the end of the day, his 64 was about as high as it could have been. He two-putted from just inside 15 feet for a birdie on the 16th, and he had another birdie chance from about that range on the 18th that would have tied the course record. No matter. He was in the lead, facing a Sunday pairing with Fleetwood as he goes for the most important win of his young career.